This coming autumn I will start to send out vessels part of the art project 100 MIGRATORY. Today I have 15 Swedish embassies around the world that will receive a vessel of glass as a loan for up to half a year. Spain, Hungary, Brazil, Chile, Serbia, India, Saudi Arabia, Germany, Iceland, Australia, Japan, Mali, Belgium, Czech Republic – and more to come. Some embassies will display their vessel in conjunction with events including Swedish art or crafts or themes concerning migration and globalisation (USA 2013). Several private persons and business companies will also look after glass part of 100 M. Vessel no. 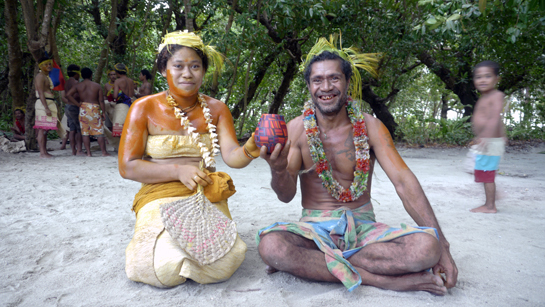 16 is first out on a tour with photographer and filmmaker John Erling Utsi around Tikopia, Solomon Islands and Vanuatu. 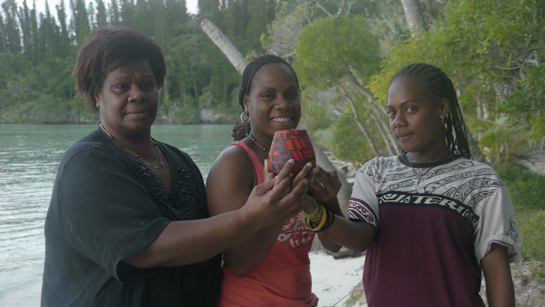 Image here with three beautiful ladies on a small island Ile des Pins, New Caledonia. Vessel no. 17 will be carried “by foot” over the mountains from Ritsem to Tysfjord , to be displayed at the home of Nikolaisen Kuoljok as well as Árran LulesamiCenter in Drag Norway.